Whilst all care has been taken in compiling this information, no guarantee can be given as to its accuracy or otherwise. Any person who can assist with more details of the Dawson Family I would be pleased to hear from them. Ian Gazzard Editor. Dawson Family of Southland N. Z. 1. ( Sir William Dawson ? Married Maria. This is in doubt ) Also and more likely is John Dawson b. 11th January 1769 d.7th May 1810 buried St Boltophs London, m. Thomasina Hinde 12th June1801 at St Mary Islington London, linen draper of Aldgate London and Norfolk England, Draper and Haberdasher. Admitted as Free to the Worshipful Company of Haberdashers 11th September 1800.and took the oath as required to trade. His father was John Dawson lived Le Burgh Marsh, Lincolnshire, Grazier, and mother was Mary. 2. John Dawson b. June 27th 1802. Aldgate London. .2. Maria b. 25th Sept. 1803. Aldgate London. 2. Robert Dawson b. 16th June 1806. Aldgate London. 2. William Dawson, born 10th May 1810 London.d. 3rd Dec 1883. Married to Ann Lydia Barrett at Roscommon Ireland. Anne was born in 1809 at Staffordshire England the daughter of Ebenezer Barrett (Mechanical Engineer) and Ann. Ann Lydia Dawson, (Nee Barrett) died at Invercargill New Zealand on the 4th. August 1894. William was a Civil Engineer and worked on surveying the early English rail system. Moved to Tasmania as a town surveyor.William and Ann arrived in Van Diemen's Land in 1833 on the "Cabotia" accompanied by baby Sophia. In 1856 William accompanied by a well known Tasmanian settler ,Thomas Johnson, examined the Kentish Plains and they surveyed and opened up a road between there and the town of Tarleton. He later moved to Invercargill by 1861, in New Zealand, where he was Town Engineer. He built many bridges in the Southland area. Died in 1883 while holding the appointment of Town Engineer. Willliam's marriage to Anne Barrett displeased Sir William Dawson intensely and he banished his son and disowned him. William junior was admitted to the Grand Royal Arch Chapter of the Masonic Lodge of Ireland (no. 226 ), Dublin, on the 9th November 1831. (the original certificate is in the possession of Ian Thomas Gazzard Wanaka N. Z. a descendant ). After William's brother drowned his father wrote to him and forgave him asking him to come back to inherit his brother's estate but William had not forgotten his hurt and refused to go. Later generations have tried to get possession of these estates but to no avail. 3. Sophia (Sarah)b. 1832 d. 9th Sept.1893 at Kennington N .Z. m. 11th September1855 Christopher Bonney in Launceston, Farmer 7 sons 5 daughters, lived Kennington near Invercargill. Some of the childen were - Daughter Emily Ann b. 1861 m. 10th July 1890 to Alfred Henry Dawson (Cousin),Daughter Henrietta m. Arthur William Dawson (Cousin) 21st Oct. 1880. 3. Hannah Thomasina. b.1834 m. 16th May 1853 Henry John Mitchell Launceston Tasmania. 3. James Henry Dawson, farmer /saw miller born 1835 died 1899. Lived at Long Bush (formerly Brunswick) Southland near Invercargill. James married Ann Sarah Thompson of Port Sorell ,Tasmania circa 1855. Sarah lived to about 94 years old died at Invercargill. They had 13 children. 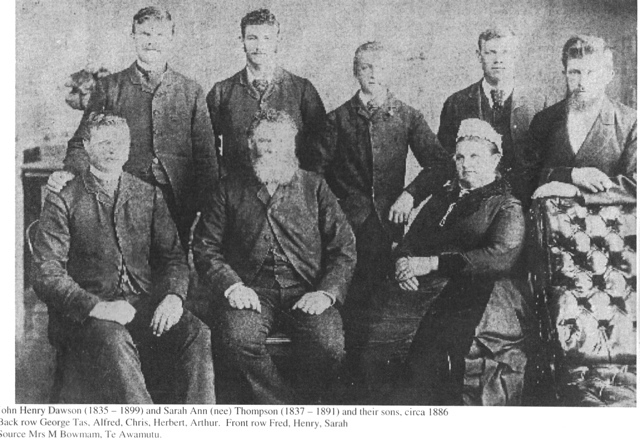 John Henry and Sarah Ann Dawson and sons. Sarah Ann Dawson (nee Thompson). 4. Hannah Marie Dawson (Annie) born 18th March 1858 Kentishbury, Port Sorell, Tasmania. Married in 1877 to John Brown Long Bush (Brunswick) near Invercargill. They had 2 children one was 5. (a) A. G. Brown. 4. Henrietta Dawson (Hettie) born 29th April 1863 Kentishbury died 21st September 1925. Married Thomas Edward Gazzard 9th.September 1884. They had 6 children. 5. (a) Sarah Lenore Gazzard m Neil Walter Cook, (b) William Henry Daniel Gazzard m 1. Pearl Cole m 2. Mary McKenzie, (c) Effie May Gazzard m.Isaac McQueen, (d) Edward Tasman Gazzard m. Elizabeth Smith, (e) Bertha Frances Gazzard m. Roderick McDonald, (f) Thomas Harwood Gazzard m. Olive Agnes Graham. 4. George Frederick m.1909 to Mary Crowley 7 children John Alice Bill Shelia Noel Brian and Frank, (b). Edith Annie Louisa Mary d. 1982. m.1914 to Leslie Retalic Taylor 2 children Bill and Vyvan, (c).John Henry d. 1979. m.1912 to Effie Elliott 2 children Chrissie and John (Jackie), (d). Joseph Edward b. March 1893 m. Althee Laurie 4 children Margaret Harry Reginald and Stewart,(e). Alice Maud b. June 1895 m. 1. Raymond Morton Lyons 2 step children Helen and Gillian,2. John Gerrad Graham lives Dunedin. (f).Lillian Agnes d. 1986. m. William Couchman 2 children John Nicholas lives Palmerston North and Shirley Crofts m. Allan Bradley 1956 Lives Te Anau, (g). Tasman Thompson b. 4th May 1899 d. 1985. m. Jessie Lawrence Moyle b. 22nd Nov 1897 6 children (i). Phoebe Joan b. 23rd June 1924 d. 7th Nov 2008 (ii) James Tasman b. 29th Dec 1925 d. 16th Feb 2007. (iii) Eric George b. 17th Dec 1929 lives Aus. (iv) Ian Moyle b. 7th Sept 1932. (v) Nola Mary b. 3rd July 1935.and (vi). Graham Lawrence b. 12th Feb 1937. (h). Anne Theresa d.1989. m. Albert Roberts 1 child Graham,(i). Hilda Mary d. 1992. m. Nathan Wood Millard 1 child Beverly Anne Coppin lives Te Anau, (j). Grace Elizabeth single d.1990 Dunedin. 4. Herbert Henry Dawson born 3rd July 1866 Port Sorell, married in 1889 to Margaret A. Fisher Invercargill. They had 9 children. 5. (a) Sarah Dawson m. Than Dunn, (b) John Henry Dawson born March 1893, died 12th October 1917 at the war. Reference Tyne Cot Memorial Belgium. (c) Norman Dawson m. Cis Fisher (cousin), (d) Ettie Dawson m. Bob Hector, (e) Bertha Dawson m.? Lindsay, (f) Annie Dawson m. Phil Tregarthan, (g) Frank Dawson (h) Bert Dawson m. Daisy, (i) Maude Dawson m. Jack Dawson (grandson of George Tasman Dawson). 4. Alfred Henry Dawson c. 1861 married (cousin) Emily Ann Bonney 10th July 1890 Brunswick. They had 3 children. 4. Christopher Bernard Dawson born 12th October 1872 Port Sorell married to Anne Canty. They had 2 children. 4. Daisy Dawson married to James Calvert Roslyn Bush. They had 3 children. 5. One was Vera Calvert who m. Bob McLellan. They had 4 sons and 1 daughter. 4. Louise (Louie as signed by her on a card) Dawson married to Donald McKay Roslyn Bush. 4. Frederick Walter Dawson married in 1891 to Ada Brown Brunswick 6 children. 4. Effie May Dawson married 1897 to Thomas Alexander, Woodlands 7 children 5 (a) Mina Alexander m. Bill Peters, 1 child boy (b) Nita Alexander m. Harry Mills, 4 children (c) James Alexander m. Ellen McLew had 4 children. (d) Roy Alexander m. Elaine Henderson Children 3 (e) Alice (Ali) Alexander m. Stan Henderson no children. (f) Minnie Alexander m. David Holland 3. children (g) Effie Alexander m. Stan Moffat 2 children? 4. Frances (Fanny) Maud Dawson married in 1909 to George Henry Hunt b 1857 Hawkes Bay saw milling Farming. then to Putaruru and Buckland Auckland d. 1946 aged 89. 3. Arthur Dawson Horse Dealer. 3. William Charles Dawson b. Kings Meadow Tasmania13th May 1837 died 1888 a twin. m. Elizabeth Perkins (or Craw? or was it a 2nd m.) in 1860 d. March 1st 1918 at her residence 276 Brisbane St. Launceston Tasmania aged 74 years. Children. Cecilla b. 1861, F. 1865, Lilly May b. 1865, Ida Victoria b. 1867, William Claude b. 1868, Minnie Blanche b. 1870, Basil b. 1871, Ethel Violet b. 1875, Russell Henry Aubrey b. 1878, Claude Ambrose and Arthur Lewis b. 1880, Elbert Bernard b. 1881. William Lived Launceston Tasmania.d. about age 45. Elizabeth's obituary in Weekly Courier March 1918 stated that she was the wife of a prominent businessman, son of one of Launcestons first surveyors, who pre deceased her by 30 years. 4.Grace Dawson married in 1882 to Harvey. 4.William C. Dawson. m.1882 Elizabeth Craw she d. 21st March 1918 Launceston. 4.Ebenezer Dawson died as infant. 4. Minnie Dawson married to Aston. 4. Cecelia Dawson married to Bishop. 4. Amy Dawson died as an infant. 4. Emily Elizabeth (Lizzie) Dawson born 21st March 1867 Port Sorell married in 1882 to Grindlay. 4.Henry Oswald Dawson born 4th December 1872 Port Sorell. Married 1898. 4. Gertrude Dawson never married. 4. Ethel Rose Dawson married in 1900 to Carson. 4. Blanche Dawson married to Cowley. 4. Euphemia Amy Maud Dawson married 1905 to Iremonger. 4. Winifred Dawson married to Matthews. 3. Letitia H. Dawson born 1839. d. drowned River Mersey 18th - 22nd august1855. An inquest was held 24th August 1855 at Sherwood, Latrobe,at her father's home Tasmania. 3. Christopher Walter Dawson born 1846 died 3rd August 1905. Never married. Owned 3 Saw Mills with brother Alfred whose family inherited his estate. It is said he went to South Africa mining and was very wealthy. 3. Alfred Dawson. Surveyor. Waikiwi Invercargill. m.1873 ?. 4. Emily Ann Dawson born 1861 married 10th July to Alfred Henry Dawson (cousin). 4. Henrietta Dawson married to Arthur William Dawson (cousin) on the 21st October 1880. 3. Annie Dawson born 1850 died 1903. Married to John Taylor Roslyn Bush Southland 3 children. 4. Evelyn Taylor never married.